CTD is an acronym for the parameters that this device measures: “Conductivity, Temperature, and Depth.” The CTD itself is a set of small probes attached to a metal cage called a rosette. The rosette, which also has long, cylindrical bottles for capturing samples of seawater at different depths, is lowered on a cable down to the seafloor. Scientists then analyze the water samples for their chemical properties. This information, along with water temperature and salt content, is important to oceanographers because it tells them about the types of water masses present and how they are moving in the ocean. 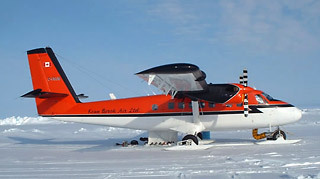 At NPEO, scientists from the University of Washington and Oregon State University will be using a Twin-Otter aircraft to conduct a series of CTD casts along a set of lines, or “sections.” So although the data is limited to a single “snapshot” of that day, the aerial survey allows oceanographers to see a 2-dimensional side-view of the water properties (temperature, salinity) through the water column over a large area.